The UN Security Council has imposed sanctions on Eritrea, accusing the country of backing Islamist insurgents in Somalia. The resolution places an arms embargo on Eritrea, and also imposes travel bans and asset freezes on businesses and individuals. Members of the Eritrean leadership are expected to be affected. Eritrean officials have repeatedly denied the allegations, calling them a "fabrication" of US intelligence. The resolution was backed by 13 votes to 15. China abstained while Libya, the only Arab council member, voted against. The country suspended its membership of the African Union in protest at the call for sanctions in April. 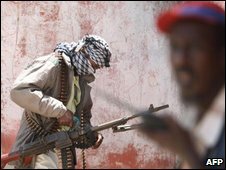 A draft of the resolution obtained by Reuters news agency demands that Eritrea "cease arming, training and equipping armed groups and their members including al-Shabab". As a result of the Security Council vote, Eritrea becomes the first new country to be subjected to UN sanctions since they were imposed on Iran in 2006. In a letter to the council last week, Eritrea's ambassador to the UN, Araya Desta, called the sanctions "ludicrous punitive measures". He warned that their imposition risked "engulfing the region in to another cycle of conflict as it may encourage Ethiopia to contemplate reckless military adventures". The UN has frequently expressed concern about the flow of arms in to Somalia, where hardline Islamists of al-Shabab and Hizbul-Islam are battling with government forces for control of the capital Mogadishu. Somalia has been subject to a UN arms embargo for many years, but weapons are still freely available in the Mogadishu weapons market.